I spent an hour or so cleaning up the garden this afternoon. 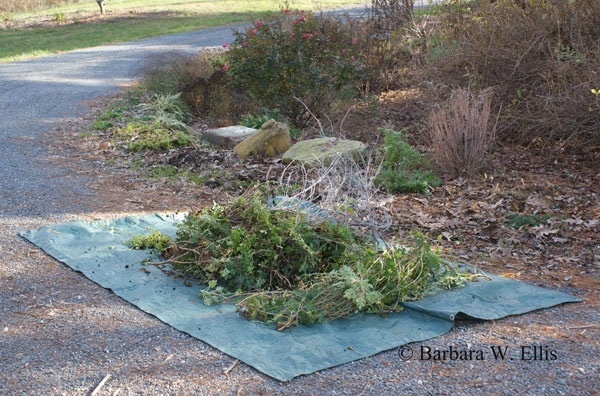 As I was pulling up the first of the winter weeds and cutting back chrysanthemums, I heaved all the debris onto an ordinary green tarp that I have used again and again this year. Since it has become one of my favorite tools this year, I thought I should write a few words about it. My tarp is nothing special. The one I use is about 6 feet by 8 feet. It is big enough to collect a fair amount of garden debris, but not so large that it gets heavy or cumbersome to pull along the ground, which is the method I use for transporting whatever I’ve collected to the compost pile. A tarp is perfect for gathering up garden clippings. Just spread it out next to a bed and heave from wherever you are working. Tarps are also great for collecting leaves, because all you need to do to move a pile is rake it onto the center. As long as you don’t collect too much on top of it, you can pull a tarp wherever you need it just by grabbing a corner. A tarp also comes in handy for containing the potting soil and other mess when filling and planting containers in spring. Or use it when transplanting: Place plants to be moved on the tarp. Or when digging holes: Shovel soil from the hole onto the tarp to keep it off the grass. Fortunately, a tarp is as inexpensive as it is handy. The one I have is a standard two-layer type. (It’s green on the top and brown on the bottom, but there are many other color combinations.) Mine has reinforced hems and also grommets along the edges. You can find them in any hardware store for about $10.00 . There also are economy and heavy duty tarps. I would recommend against the single-layer economy type just because heavier construction will withstand more wear and tear. A heavy duty tarp isn’t necessary. Not only will it weigh more, it will also be stiffer and more cumbersome to use. Another great reason a tarp makes a wonderful tool is that it also doesn’t take up any space in the toolshed. Just fold it up and stick it on a shelf.